Several universities in Philadelphia issued warnings to their students and faculty of an "unspecified" threat of violence that was being monitored by both local and federal law enforcement agencies.The universities said they had been notified by the FBI about "a recent social media posting threatening violence at a Philadelphia area college or university on Monday, October 5". In a campus safety notice, Drexel University said that the FBI had specified that there was no specific threat to any particular institution. Drexel University, along with Temple University and the University of Pennsylvania, said that they were working with the FBI and the Bureau of Alcohol, Tobacco and Firearms to monitor the situation. The threat comes just days after the shooting at Umpqua Community College in Oregon, which saw nine people and the 26-year-old shooter killed. According to the statement by Drexel, "the FBI has seen similar social media postings throughout the country" since the campus shooting. The Daily News reported that the threat was posted on 2 October on 4chan, the same messaging board website that carried the alleged warning by Umpqua shooter Christopher Sean Harper-Mercer. "This is the only the beginning, .." the threat allegedly reads. "On October 5, 2015 at 1:00 PM CT, a fellow robot will take up arms against a university near Philadelphia. His cries will be heard, his victims will cower in fear, and the strength of the Union will decay a little more." The threat on 2 October bore a similar image, of a frog wearing a ski mask and holding a gun, to the post made the night before the Oregon shooting. It continues: "The first of our kind has struck fear into the hearts of America .. If you are in that area, you are encouraged to stay at home and watch the news as the chaos unfolds." IBTimes UK could not independently verify the Philadelphia post on 4chan, but was able to find an alleged screenshot of the threat on Reddit. 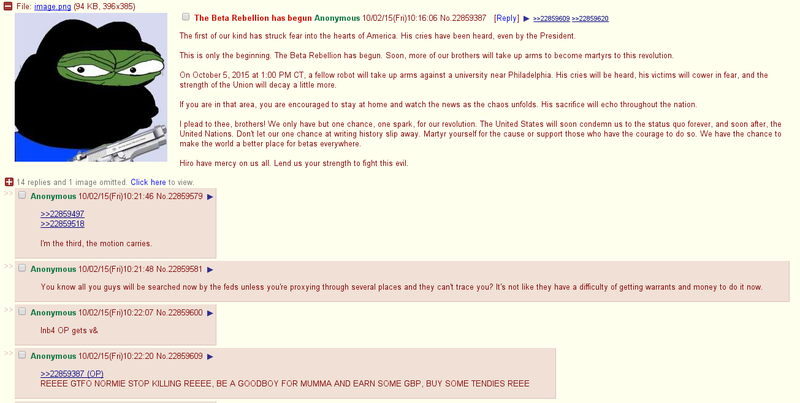 However, the website's /r9k/ or "Robot 9000" image board had several threads regarding the alleged threat. "I thought these shootings were a meme but now that it might happen to me I'm scared," wrote one anonymous poster. According to the Daily News, law enforcement agencies have not revealed information regarding either the Oregon or Philadelphia threats.